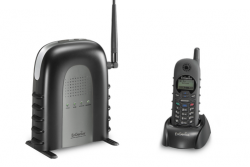 EnGenius Durafon from Aristel is the revolutionary cordless phone system that’s crystal clear over long distances and ideal where a number of handsets are required. EnGenius Durafon uses two-way radio technology to cover the extra distance needed for farms, factories, motels, resorts, caravan parks, nurseries, hospitals; even homes and offices. The more open the space, the greater the distance covered. A range of over 5km is not unusual for Durafon in rural areas.